So this photo made me cry. It just did. Not because of the beauty of the sunset. 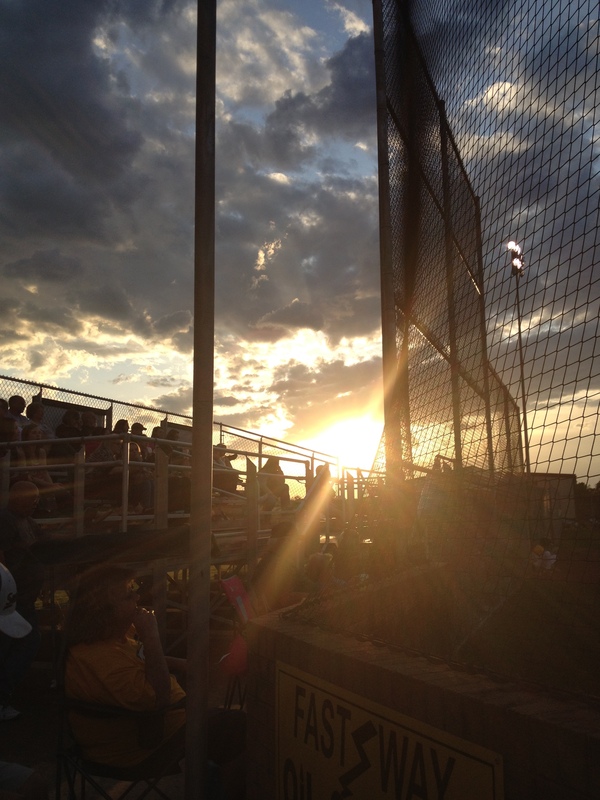 Not because of the sihouette of the crowd watching yet another home high school baseball game. (And not because I was sad to be at the game!) I had taken the photo at a home baseball game and it wasn’t at all emotional for me when I took it. I just thought the sunset was beautiful. But when I looked at it tonight, it was another story. The tears just rolled down my cheeks because this photo was so symbolic for me. The other night before the last home baseball game for a great group of kids, I, along with all the other moms and dads of seniors, stood proudly on the field with their sons, and celebrated their contribution to the team. Did you pick up on the word last? It was their last home baseball game. So that sunset over the baseball field with the beautiful storm clouds in the background? It feels so incredibly symbolic, because the sun is kind of setting on this season of our lives. And boy, those tears are rolling because it’s been a precious, precious time. I’ve loved, loved, loved, watching my number 5 third baseman play. There’ve been moments of glory, moments of sheer frustration and disappointment (quite a few not so fun ‘storm clouds’! ), moments of watching a team player that made me about bust with pride. There have been moments when I sacrificed doing a lot of other things to quietly, and sometimes not so quietly, sit on the sidelines and cheer on the players, and my number 5. There have been sweet memories made with family and friends of the team, as we’ve all watched our boys grow up together. And now we are moving on to this next phase of encouraging, equipping, and helping them to find their way as men. I’m so very thankful for these little milestones in life, for they are moments when we realize how precious our time is. When we see something passing, we are aware of how it impacted us, for there’s a void where it once was. A beautiful thing though is that even though there’s a void, there are some things that time and space and distance could never take away. The memories, the milestones, the victories and the lessons learned will stay, (along with a lot of game balls, plaques, jerseys, and weathered mitts!) But one thing will remain true on the field and off the field—the cheers that come when a player makes it to Home plate. Whether it was a cake walk of a home run over the fence, or an excruciating, strategy filled running of the bases with slips and slides and outs, the cheers are loud when the player’s cleats find their way to home base. That won’t change. Whatever field he’s on, no matter how difficult or easy the journey, no matter how near or far my number five travels, I will always cheer and celebrate when he finds his way back Home.